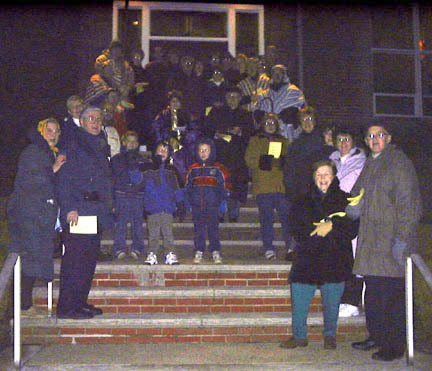 An evening Ecumenical procession celebrating the Millennium Epiphany was held from 7:00 to 8:00 p.m., on January 6, 2000. The procession started at Corpus Christi and proceeded to The First Reform Church, then to The First Methodist Church, then onto the Holy Trinity Lutheran Church and ended at St. John the Divine. 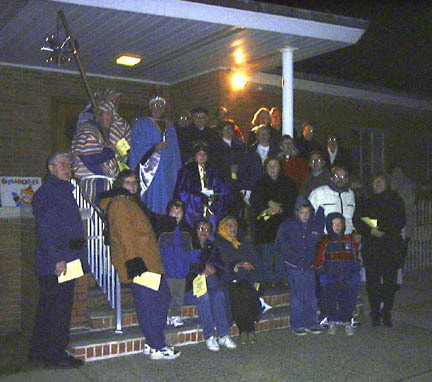 At each church there was a tableau to recount the Journey of the Magi, and included brief reciting of liturgy, and a short refrain from "We Three Kings of Orient Are". The service concluded at St. John's, with the lighting of the Christmas Tree, followed by refreshments (cookies, warm apple cider and hot chocolate) in the Parish Hall. The Ecumenical Service was organized by Fr. 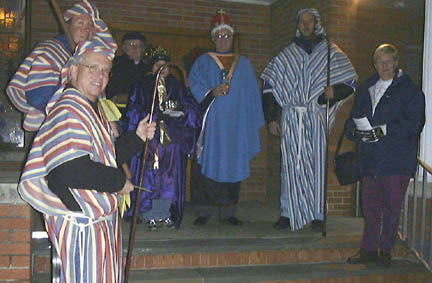 Joe Picard, in cooperation with other congregations. "The Calling of the First Magi"
"The Calling of the Second Magi"
"The Calling of the Third Magi"
"The Visitation of the Magi"
"The Lighting of the Tree"
Epiphany? Strange word -- What does it mean? The origins of the word come from the Greek language: epiphaneia, meaning "appearance" or "manifestation". 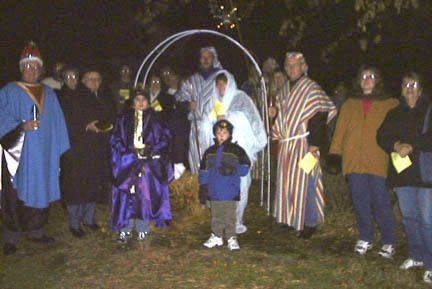 Since the 4th century it the season of Epiphany, and has been celebrated beginning on January 6th of every year.This The Epiphany, and the weeks which follow embody the season, the length of which changes each year because of the dating of Easter, and 40 days Lent observances which precede Holy Week. 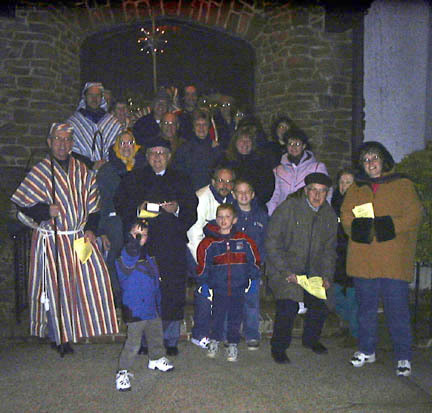 Two traditions have grown from the root meaning of "Epiphany". The first is the Appearance of the Magi recorded in scripture to the Holy child. These three Magi represent the breadth of the known world, from places far away they journeyed, following a star, to observe the wonder of God's gift to the world. And, having been warned to return home by a different route, they departed to take the news of Christ's birth to their homes. 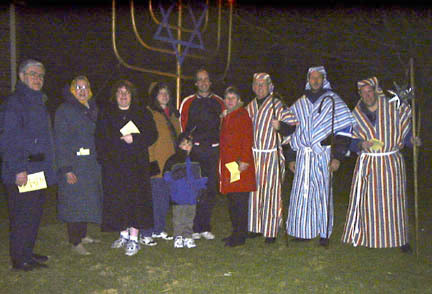 This manifestation to the world is the symbol of our inheritance of knowing who Jesus is beyond the Jewish traditions. As Christian's we regard the Magi's visit as a symbol that Christ was born not for one group of people only, but that he was the "light of the world"(JOHN 8:12). 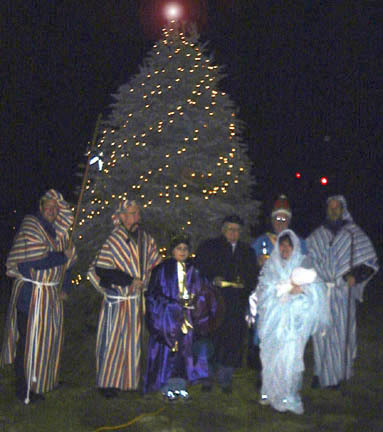 Consequently, the celebration of Epiphany is sometimes also called the "Festival of Lights". Thus in our celebration this year, we will officially light the new tree"On the corner" and crown her with the star.A representation of the one that led our procession from church to church. The tree will then be lit throughout the Season, giving light to all who pass by.